First day in Brazil…and the trip here. 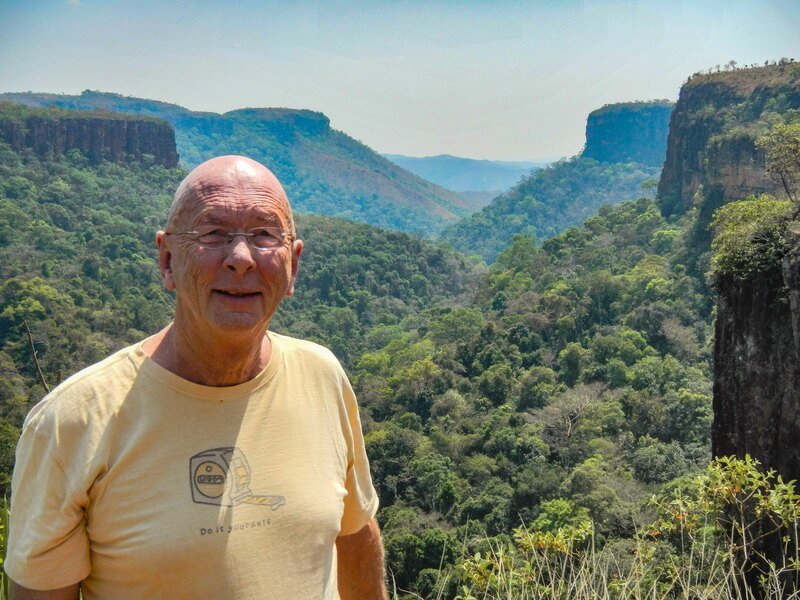 I arrived in Cuiaba, (Kwee.a.ba) a little after midnight last night after more than 24 hours flying or sitting in airports. Tomorrow morning my guide company will pick me up about 6:30 for about an hour and a half drive on the Transpantaneira Highway to Jaquar Camp in Port Jofre. After a week there, they return me to the airport in Cuiaba for a flight to Foz do Iguacu for another week. Those spots are circled on the map above. I left Dallas Wednesday evening about 10pm and flew six and a half hours to Lima, Peru arriving about 5:15 in the morning. Lima is in the same time zone as Kansas. Most domestic airlines in the U.S. won’t give you a bag of peanuts and charge for checked baggage, international flights still have a little service. Decent food and free checked baggage. Upon taking off, the crew passed out immigration and customs forms for Peru followed by dinner at 11:45. Once the service was cleared about 12:30 I thought I catch some sleep until our arrival in Lima. The lady in the window seat needed to use the facilities and tried to not bother me by crawling over the occupant in the middle seat and me. Since there is no room for your knees this didn’t work. I was awake. About 2:30 I dozed off for a good hour until the drink cart service began at 3:30 followed by breakfast at 4am. I was up for the duration. There were thousands of people lined up at the Lima ticket counters and after spending about 45 minutes working my way to the front of the line, I learned that my carrier from Dallas—American/Lan…was not my carrier to Sao Paulo, my next stop. While it was a LAN flight, it was operated by TAM Airlines and their ticket counters didn’t open until 9am. Eventually, my flight left Lima at noon and we arrived in Sao Paulo at 6:45pm with a two hour time change. Dinner on the flight to Sao Paulo was pasta or chicken with wine included. Not bad. After a three hour layover in we departed Sao Paulo at 10pm and gained an hour back and arrived in Cuiaba a little after midnight. Got a taxi to my hotel and was in bed by 1am. This morning I had a great breakfast at the hotel. It was great! Multiple choices of bread, juices, cakes along with scrambled eggs, sausage, coffee and tea. I’m paying about $72 a night for a Holiday Inn type hotel near downtown Cuiaba….a city of about 600,000 people. This morning I decided to hire a driver and taxi and see some of the area. This is Umberto, my driver for the day. 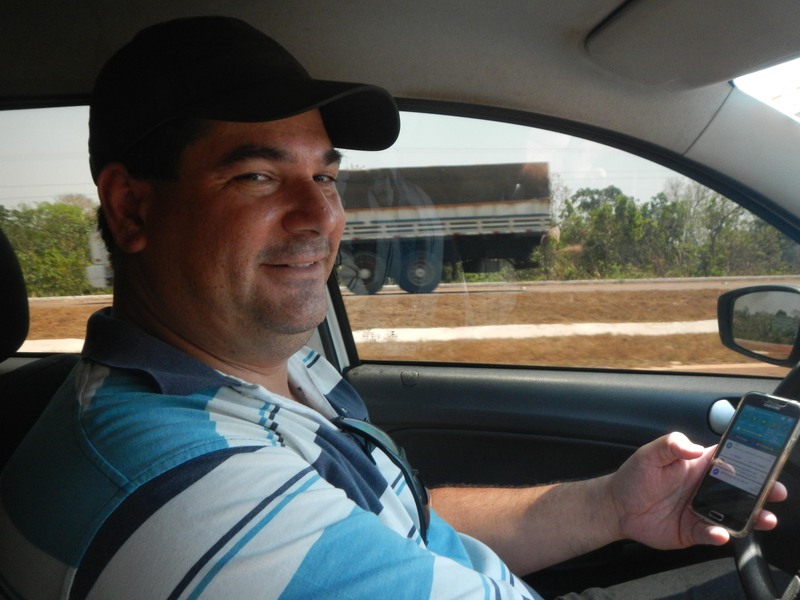 I had ask for an English speaking driver and he is…if you count the translation program on his phone. We got along okay but there was more than a few quiet moments. 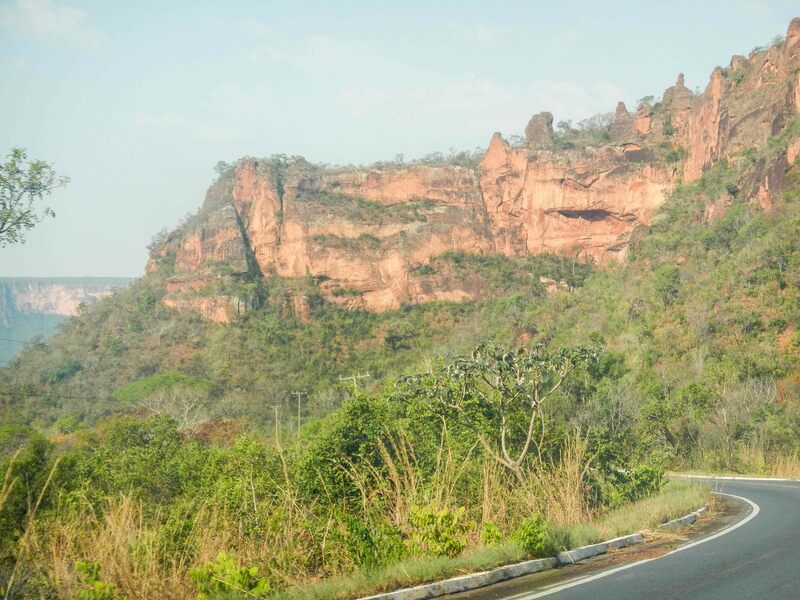 We headed north out of Cuiaba to Chapada dos Guimaraes. 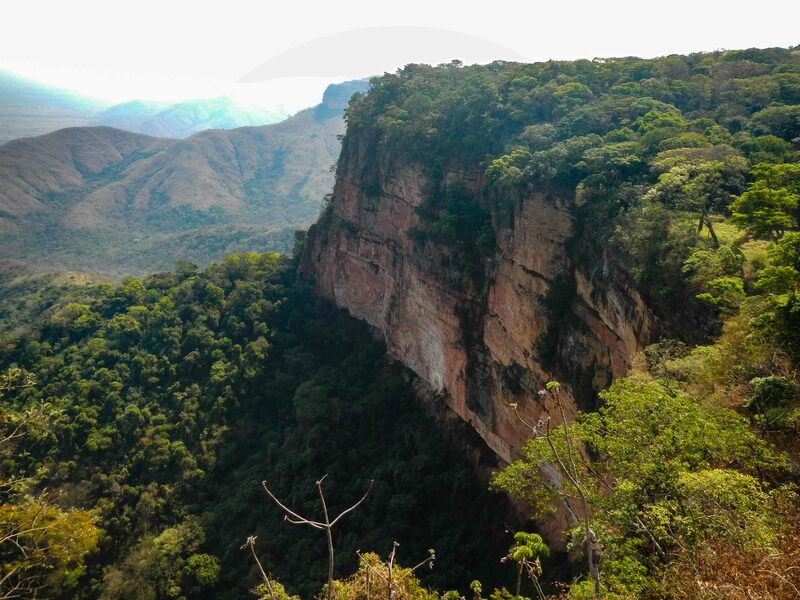 This national park is 800 meters higher than Cuiaba and is a little cooler..but not much. It was probably 100 in Cuiaba and maybe 90 in the park. 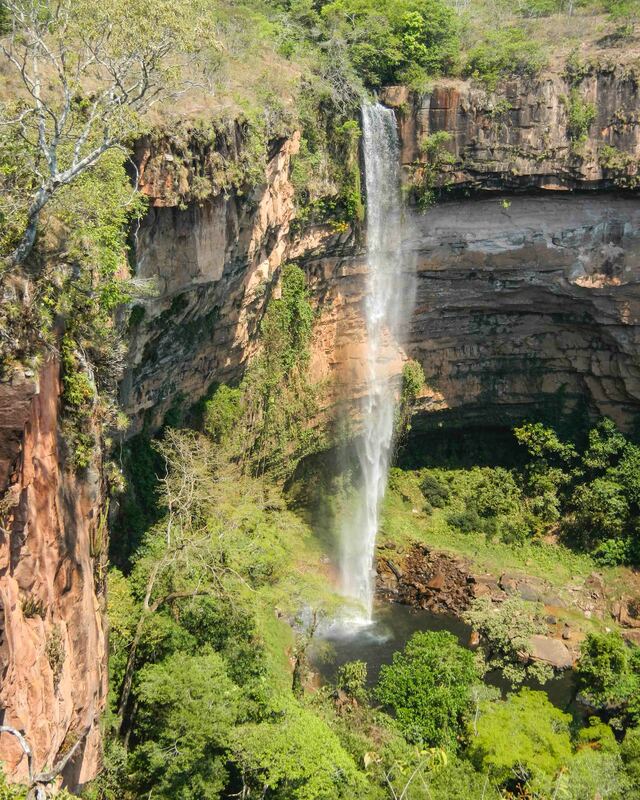 One of the attractions is Veu de Noiva waterfall. Not spectacular compared to Niagara Falls or Iguacu Falls but this 86 meter free-falling waterfall provides the park’s characteristic postcard moment. The ranger at the gate let Umberto drive to the lower parking lot rather than making an old guy like me hike the 500 meter downhill trail. There are a few advantages to being my age. This was lunch at the park restaurant. A nice place with granite tabletops. 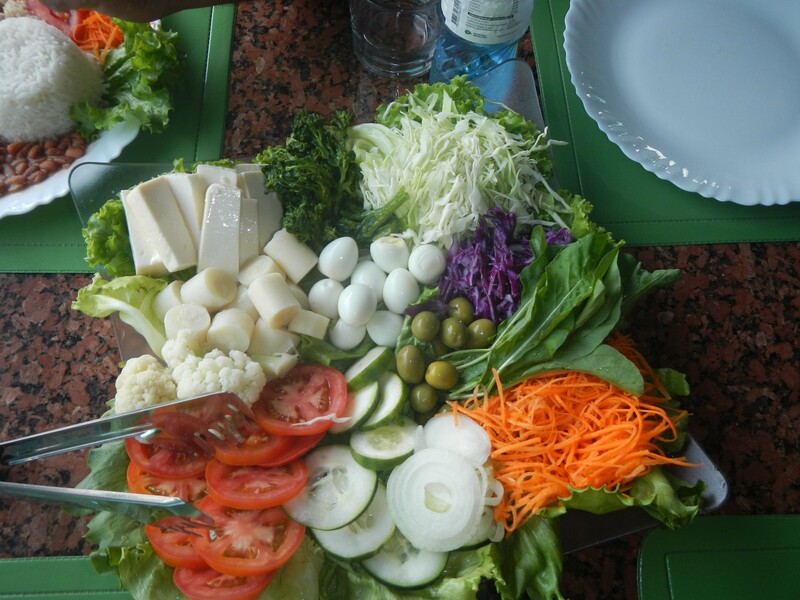 I had a salad for two (couldn’t get it for one) consisting of quail eggs, swiss cheese, hearts of palm, lettuce, asparagus, spinach, carrots, onions, cauliflower, tomatoes, cucumber and cabbage. I shared with Umberto even though he had meat and fries,too. 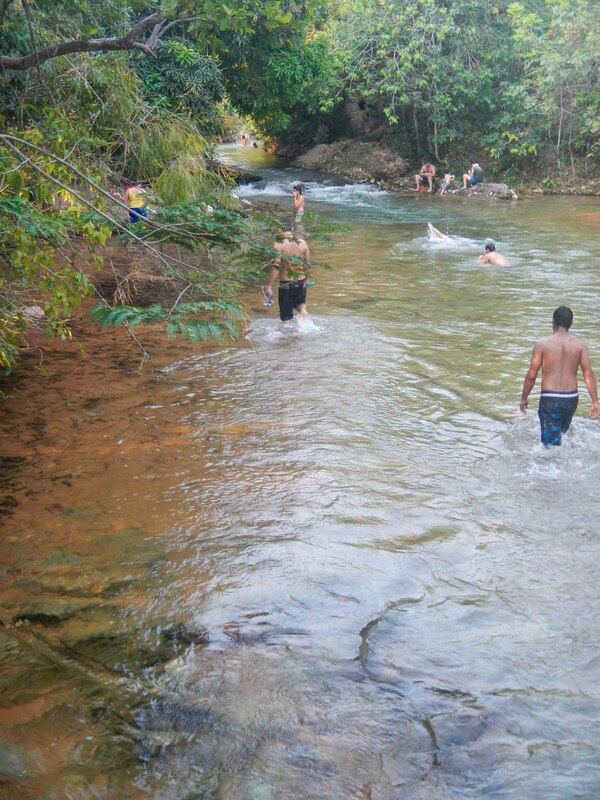 We also stopped at a couple of old fashioned swimming holes on the Rio Claro. 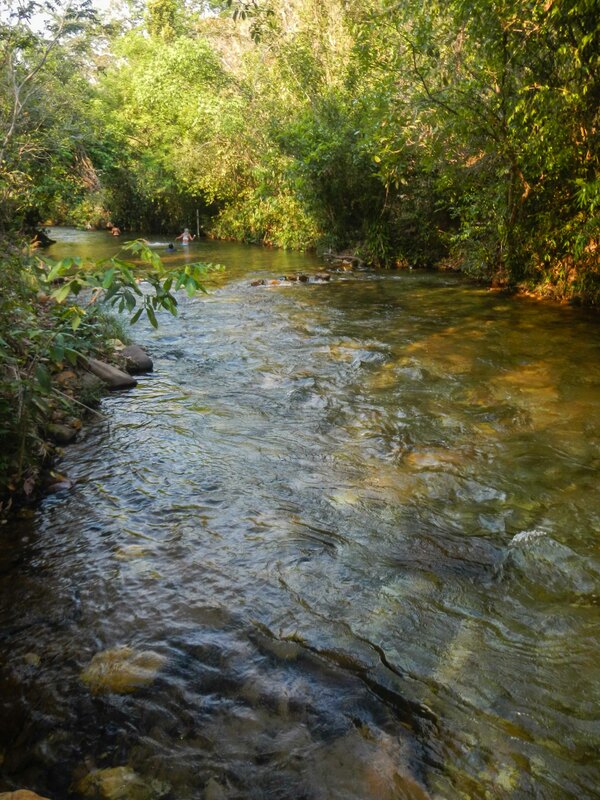 Locals come here to relax and cool off. The water here was comfortably cool and clear as a bell. Didn’t know this was on the tour or I’d brought my bathing suit. The park has a look similar to some of the Southwest US. Red rock and interesting formations. 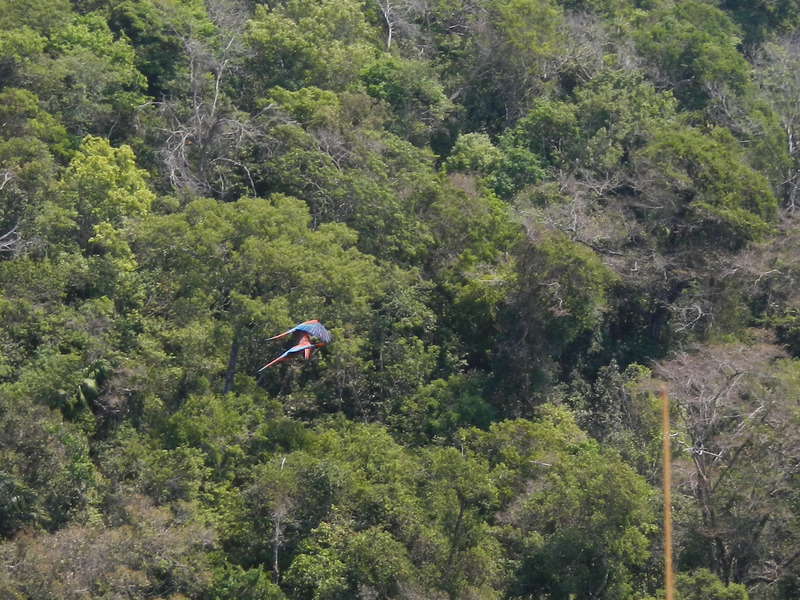 If you look carefully in the last photo on the bottom right, you can see two Toucans flying together. I hope I get better shots than these in the Pantanal. Dinner tonight was across the street from the hotel at a local hole-in-the-wall place that had chairs set on the sidewalk and on the street with families having chicken and beef skewers with rice and potatoes. I judge the place based on the crowd. If there’s a lot of people and no one is lying on the street, it must be okay. I had beef and a 600ml beer for $3.50US. Thought I was dining at the Hiway Inn in Girard. 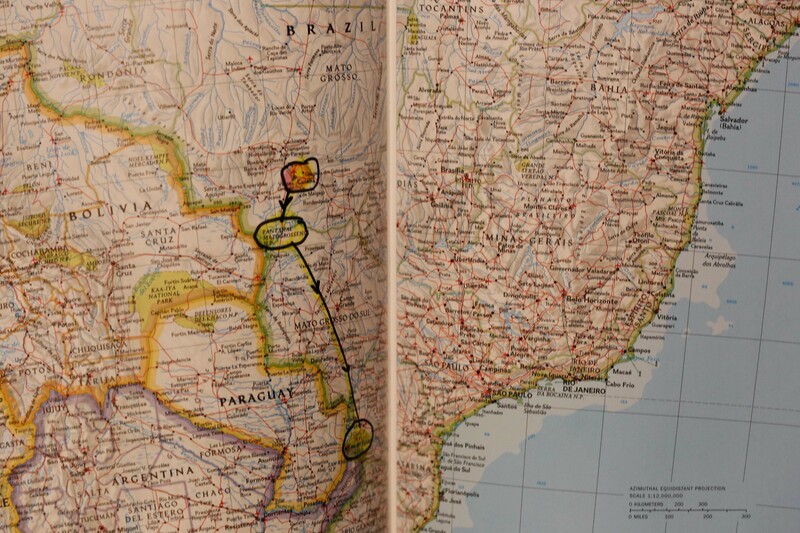 As I said, I’m off to the Pantanal tomorrow. More when I get internet service again. 1 Response to First day in Brazil…and the trip here. Ron, what a wonderful adventure that you are having, thanks for letting us enjoy it along with you!